Their music similarly mixes ancient and modern, plastic pop and soul. With Wolfe and Holly Laessig's piercing voices way up in the mix, it's 60s girl group meets synthetic 80s chart hits and the occasional indie rock guitar. 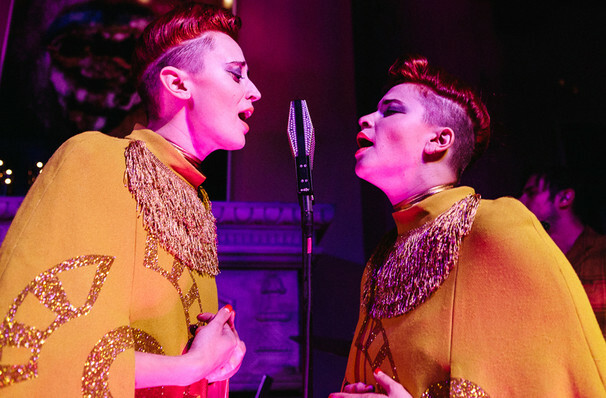 The sweet, soulful sounds of beguiling pop act Lucius were born when Berklee College of Music graduates and vocalists Jess Wolfe and Holly Laessig wrote about their shared experience living in Brooklyn, New York as musicians for hire. In 2013 the release of their critically acclaimed debut album Wildewoman marked their ascent into the pop stratosphere. Don't miss the quirky quartet as they get back to basics on an intimate acoustic tour of works new and old. The band's lineup is completed by drummer Dan Molad and guitarist Peter Lalish, and together the quartet blend soaring harmonies with raw, emotive lyrics that mine the depths of Wolfe and Laessig's relationships and friendship. The pair routinely dress as mirror images of one another, an eye-catching calling card and reflection of their close musical partnership. Sound good to you? 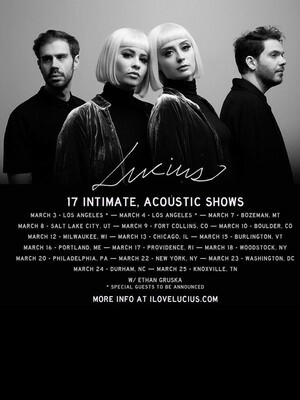 Share this page on social media and let your friends know about Lucius at Aladdin Theatre. Please note: The term Aladdin Theatre and/or Lucius as well as all associated graphics, logos, and/or other trademarks, tradenames or copyrights are the property of the Aladdin Theatre and/or Lucius and are used herein for factual descriptive purposes only. We are in no way associated with or authorized by the Aladdin Theatre and/or Lucius and neither that entity nor any of its affiliates have licensed or endorsed us to sell tickets, goods and or services in conjunction with their events.